This thesis analysed the effect of the support system (track) to the short and variable service life of Insulated Rail Joints (IRJs). 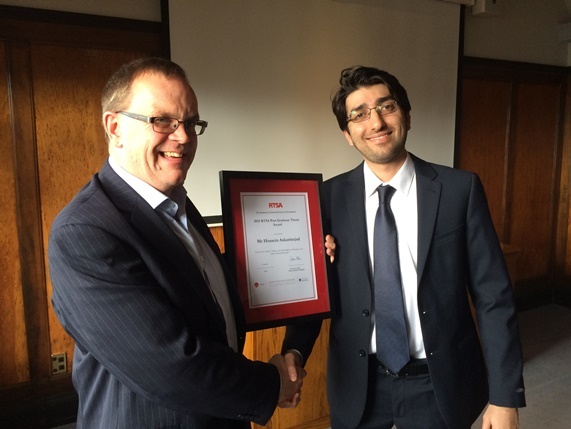 Dr. Hossein Askarinejad accepting the Post Graduate Thesis Award from Simon Wood, Chair of the RTSA Awards Sub-committee in Wellington, 2015. This thesis investigated the effect of applying a Friction Modifier at the wheel/rail interface on the overall maintenance & life-cycle requirements of rail on curves. It is known that top of rail (TOR) friction management has a positive impact with reduced wheel-rail wear, rolling contact fatigue, corrugation etc. and ultimately increase asset life which then reduces rail grinding losses. An engineering analysis and numerical modelling was undertaken in MATLAB and GENSYS environments for studying wheel-rail interactive forces, tangential creep forces and their behavior under various operating conditions. From this, the research was able to identify a holistic understanding regarding top of rail lubrication and management of wheel-rail friction in the Australian rail industry, as well as identify life-cycle cost benefits as a result of using a Friction Modifier. 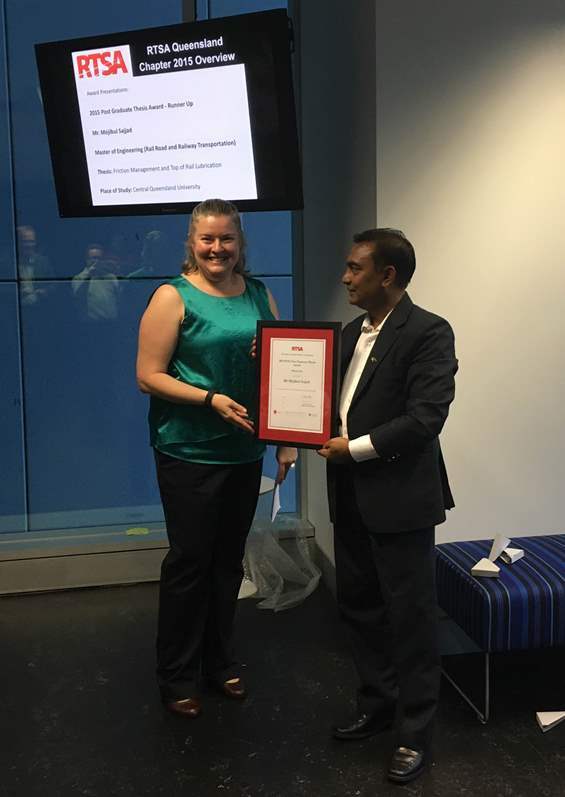 Mojibul Sajjad accepting the Post Graduate Thesis Runner-Up Award from Megan Wood, Chair of the RTSA Queensland Chapter in Brisbane, 2015.